After leaving Tampa and relocating to Denver in September, I imagined I would score an incredible full-time job with excellent benefits within two months tops. With my valuable experience and impermeable positive charm, what company wouldn’t want a guy like me? Well, when my heroic mission to change the face of Denver didn’t happen quite that quickly, it was time to bring in at least some income. I didn’t want to commit myself to a corporation like Target or Applebee’s that would expect me to “join the team” and repeat their inner-company propaganda as I secretly looked for another job. And I didn’t want to find a part-time job in the field I’m trying to enter because I’d never be seen as a leader. At UPS, the position was temporary and a way to make some fast cash. I’ve always been curious about their distribution process, and boy, did I get a surprising front row view of the inner workings of UPS. At the processing facility in Commerce City, Colorado, I worked five midnight shifts from 10:00 p.m. to 5 a.m. I would have worked a few more shifts if I hadn’t been injured by a supervisor drop-kicking a 25-lb. box on my head. (More on that later – scroll down). I learned a lot and made some observations the public may like to know, especially with the recent news on their inability to successfully plan for the holiday rush. 1. LOADING & UNLOADING PACKAGES IS HARD WORK. I consider myself to be in pretty good shape, and I’ve even moved across country eight times, but this work is without-a-doubt the most physically challenging I have ever experienced. The repetitive motion of lifting boxes weighing up to 70-lbs. nonstop for 6-8 hours is stressful on joints and muscle groups I didn’t know I had. Luckily, the crew was given one ten-minute break to relax, go to the bathroom, eat and refill our water bottles. 2. LOADING & UNLOADING PACKAGES IS MINDLESS WORK. The pre-requisite for this job was confirming you had transportation to the facility. There is no thinking involved: lift package, put on cart, take cart to conveyor belt, put package on conveyor belt, repeat. That’s it. No strategy, no critical-thinking. And you don’t have to talk to anyone. I surprisingly enjoyed this element. I have always held positions that were extremely stressful, required decision-making bound to undoubtedly upset a few people, made me play the office politics and demanded being creative on-the-spot. For a nice change of pace, I was thrilled to show up and not think. For the first time in my life, my job was not stressful. 3. LEARN THE NAMES OF THE PEOPLE YOU SUPERVISE. “Hey, buddy, could you take this package down to Colorado Springs, gate yadda yadda?” First of all, we aren’t buddies. Secondly, yes I can do that. Thirdly, it would have taken you 6 extra seconds to say, “Hi, what’s your name? Nice to meet you! Could you do me a favor if I treat you like a human being?” Acknowledge the people who are around you. You never know when your leg will get caught in a conveyor belt and you need your “buddy” to flip the emergency stop switch. Now, I was a temporary worker and investing in me is not really a top priority. But even the last place I worked, the CEO never once introduced herself or asked me one question in the entire year I was there. Remember, leaders are pulling the weight at the front of the line, not standing in back shouting at their employees to go faster. 4. INEFFICIENCY WASTES TIME AND RESOURCES. While I enjoyed the mindless work, it was also meaningless. Due to a particularly inefficient model in the sorting system, a significant load of packages gets sent to different parts of the facility where it doesn’t belong (called misflow by the UPS folks, though the dictionary tells me misflow is not a word). So, the truck loaders would weed out the bad packages and send them down the chute to me. I loaded these boxes onto a cart and put them on a conveyor belt to be sorted AGAIN. By golly, these packages would appear on my cart three to four times. Being an organizational guru, I wanted desperately to sort them myself and deliver them to the proper trucks. It would have taken less time, but I’m sure there is a highly paid organizational efficiency consultant working on this right now! 5. PASSING GAS WHILE CLIMBING DOWN A LADDER IS A MISTAKE YOU MAKE ONLY ONCE. 6. FRAGILE and HANDLE WITH CARE MEAN NOTHING. I cannot stress this enough. If you ship via UPS, wrap your contents in 3-inch bubble wrap, encased in molded styrofoam, drowning in a sea of packing peanuts, locked in a waterproof safe. I was taught during my orientation training that UPS policy was “hand to surface,” meaning no package should ever leave someone’s hands until it has reached the next surface. No one, and I mean, NO ONE, at this facility followed this procedure. I saw packages pushed, dropped, kicked and thrown by almost every worker (including the supervisors training me). There is no special handling technique for boxes marked “fragile.” So before you send off that special glass snow globe to your goddaughter, ask yourself this one question: Would I roll this package down my basement stairs? If you wouldn’t, don’t send that package. And buy insurance. 7. PROVIDE EMPLOYEES WITH INFORMATION. This sounds vague, but I was given ZERO contact information. If my car broke down, there was no phone number to call to let a manager know. I didn’t even know who my manager was. Need your paycheck? Don’t know where it is or how to get it. Question about your work schedule? Not gonna tell you what it is. The phone lines to the building where I was interviewed didn’t accept incoming calls. (I tried calling the recruiter from my cellphone’s caller ID). I called the Human Resources phone number listed online. A computer-generated voice told me to call my local hub…which doesn’t have a number listed or accept incoming calls. 8. DOING THE JOB RIGHT IS BETTER THAN DOING THE JOB QUICKLY. The aforementioned chute of “misflow” (pictured above) had filled to the brim due to a lack of coverage on our belt. 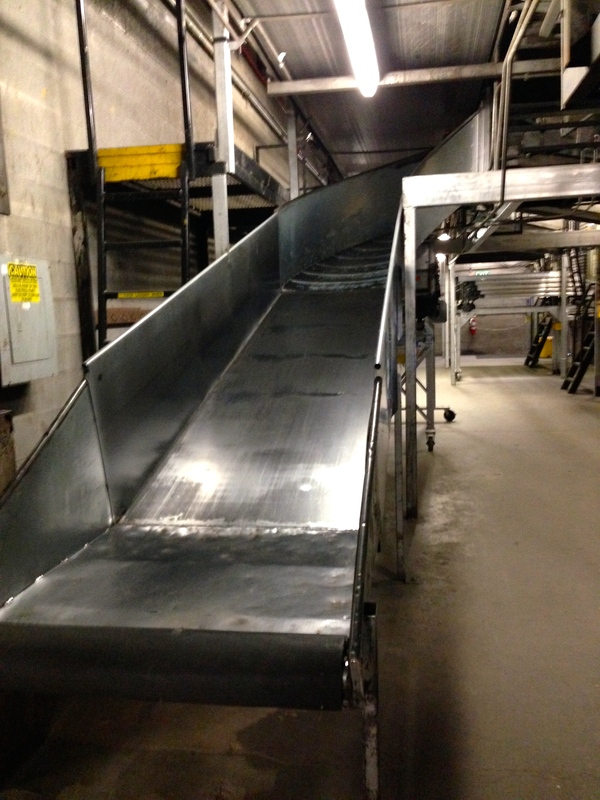 Instead of clearing the chute, the supervisor and package scanners continued to dump packages on it to beat the clock. A package fell off the top onto the concrete below. 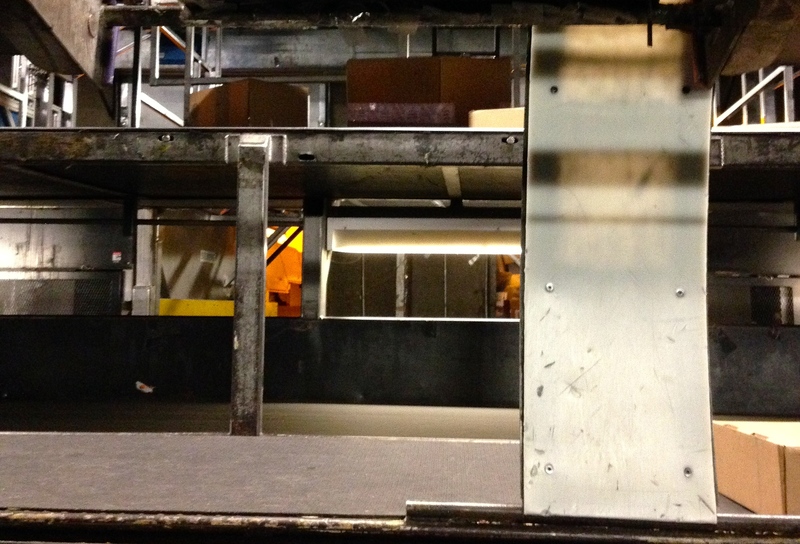 I noticed it, bent over to retrieve it as my supervisor, perched on the catwalk at the top of the chute, kicked a 25-lb. box onto the full pile of packages. This caused it to slide off the edge and land squarely on my head. There are so many things wrong with this, I don’t know where to start. It is a safety hazard to continue sending packages down an overflowing chute, it is against policy to kick a package, and it’s stupid these packages aren’t sorted to the right location in the first place! It also left UPS without a worker for the two busiest days before Christmas and gained them a workers’ compensation medical bill. (For those concerned, I am fully recovered and suffered no permanent brain damage). 9. ENUNCIATE AND THINK ABOUT THE LISTENER WHEN COMMUNICATING. I can still remember my middle school drama teacher shouting from the back of the cafetorium (yes, the cafeteria-auditorium combo), “DICTION!!! PROJECT!!! DICTION!!! !” He was right. We must learn to speak so words fall on the listener’s ear to maximize understanding. It wasn’t unusual to see a bunch of people mumbling directions and facing away from me when speaking as a loud machine rattled in the background. I said “see” this happen because I could not hear you! You have to enunciate, especially if you’re using made-up UPS lingo I have never heard before. Face the listener so sound REACHES my ear. At one point, I was given the task of turning the 2nd floor conveyor belt on and off as another worker fifteen feet away made sure the boxes were going to the right truck. They would scream, “ON!” when it needed to move and “OFF!” when it needed to stop. Now, without consonants, it sounds like this: “AHHHH!’ and “AAAAAAAAAHH!” If I didn’t hear them in time, they’d scream louder, “I SAID, AAAAHH!” Needless to say, it is difficult to distinguish between the two in a loud environment if I could hear them at all. One guy, though, had it down. He shouted, “READY!” both times and changed tones when the syllable changed. It seems simple, but “rea-DAY!” was incredibly efficient since my ear could easily distinguish two sounds as a distinct signal from a human and not a bell or buzzer from surrounding machines. 10. SENDERS ARE PART OF THE PROBLEM. Multitudes of packages didn’t have enough tape sealing them shut. Flimsy, recycled boxes were used to house 80-lb. car parts. Every single Office Depot box of copy paper split open and spilled white 8.5 x 11s all over the place. Seriously, Office Depot, rethink your packaging for reams of paper. Or better yet, people, don’t order copy paper. Go to the store and buy it. Again, doing the job well is better than doing the job quickly. If you cut corners, it will catch up with you eventually. Take the time, do it right. Poorly packaged items slow down the process and will delay shipment. So, you may be in a hurry to get that package out, but it’ll bite you in the long run if done in haste. And if you think it’s not worth it, reread number 6 above. 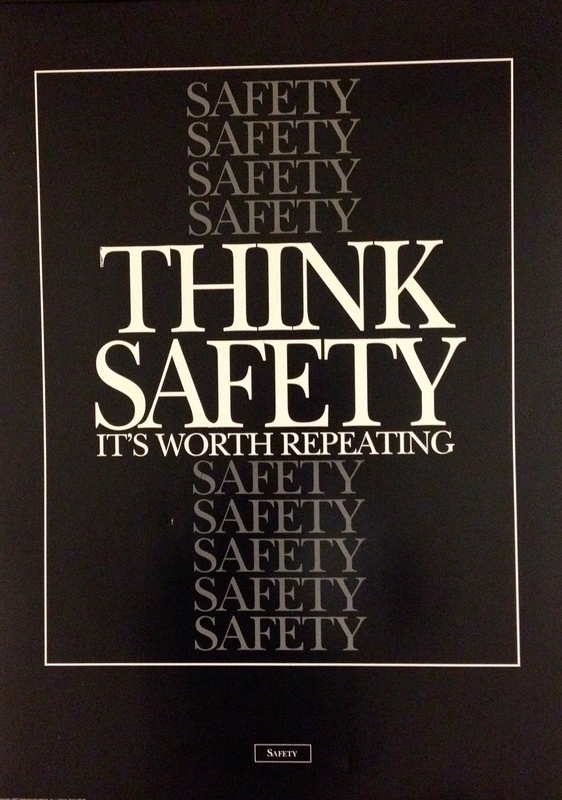 Ironically, I snapped this photo of this safety poster hanging in the UPS office on the way to report my supervisor dropping a 25 pound box on my head.